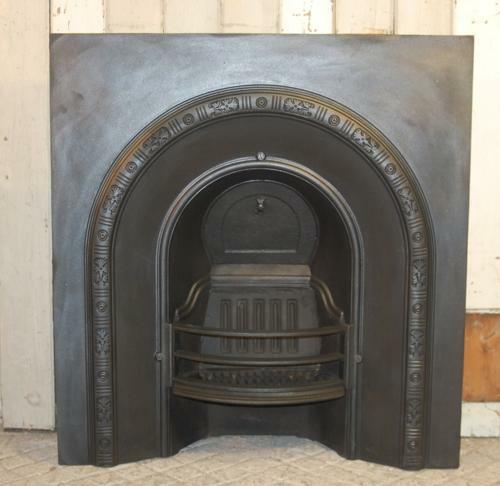 A very pretty late Victorian cast iron fire insert. The fire insert is a large item, ideal for a living or dining room and to be surrounded by a decorative fire surround. The fire has a classic design with a repeating decorative border around the fire opening, featuring flowers, linear pattern and circles. The fire has been blacked and polished and has a beautiful finish. The fire has an RD number that is now hard to read but is believe to be RD41092 dating the fire to 1886. The fire is in good useable condition, however ,the fire has had some repairs and slight signs of wear. There is some damage to the grill, which has been repaired. The fixing bolts can be seen from the back of the fire and the grill has a section missing on the left hand side. Burning wood is ideal but purchaser would need to be careful if burning coal. Some small marks and scratches. The back has surface rust as expected. The fire has a lovely, classic, style that would go with both a modern or period home and is a very pretty and desireable item.